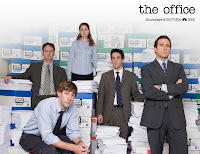 Some of my favorite lunchtime conversations over the past few years have consisted of finding counterparts for the characters in The Office in my very own workplace or circle of friends. Little do my fellow church staff members and friends know, but I have indulged this ridiculous impulse with various people. So one week you are helping me find out whether so-and-so is Angela or Kelly and the next week I am with someone else, making the emphatic claim that you are Dwight Schrute! It is quite shameful, really. 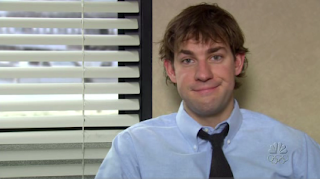 So while many of the variables in this equation change due to the fact that I am a spineless, two-faced turncoat, one factor remains constant: I am Jim Halpert. The reasons for this are obvious: I'm good looking, cool, I have a hot wife, and most of all, I am surrounded by idiots. I could never be Andy Bernard: that guy is such a tool, and definitely not intelligent enough to be my analogue. Dwight? No, he's too dark. I'm a nice guy. Michael Scott? "Woe to those who put darkness for light and light for darkness"! Unfortunately, all of this demonstrates all too well the way I often read the Bible or sit through (or prepare) a sermon. While some texts don't allow this at all (thankfully), far too often other texts have their stinging applications and appropriations elided in favor of something that is more favorable to my ego. How often do I not even consider the fact that I am the bad guy in the text? Do I read the gospels and constantly see myself addressed as one of the Pharisees? Of course not! I am the widow with her two mites or Peter who, while somewhat addicted to chewing on his foot, is still one of Jesus' closest disciples. But me, Judas? It just could not be. What I am trying to say is this: our reading of the Bible and listening to and preparing sermons (and even our watching of The Office) would be much more profitable--and much more Christian, for that matter--if we put ourselves in the place of the villains just a bit more often. Imagine how much better your boss would be if he could just see, once and for all, that he is Michael Scott! The problem is, he probably watches The Office in precisely the same way you do. Besides, this misses the point. The point is for me to realize that I am Michael Scott (and Andy and Dwight, too). By the way, I do think New Testament scholar Edwyn C. Hoskyns (The English translator of Barth's Romans) has a little book of lectures on reading the Bible that touches on this topic. It's called We are the Pharisees.